We carry three different widths and an analogy to silk is appropriate. The finer this stuff is, the more turns it takes to complete a wrap and, if you’re not careful, the more prone it is to breakage. But – darn – the fine stuff looks good (2.00, & 2.50). The thicker strips are perfect for restoration work. Use a cork under-grip that is approximately 3/16” smaller in diameter than you want your final grip—what a great way to use up pitted, low-grade cork since it will be hidden anyway. Wrap the rattan over a thin layer of woodworker’s glue and tuck the ends under your reel seat and winding check (or tuck the ends under preceding turns, similar to tying off a thread wrap, when making rattan half-grips—pictured). Don’t forget that the prettiest rattan grips always have a single turn of red or orange silk inter-wound between each turn of rattan. This serves to fill what small gaps may otherwise be visible between the turns of rattan. Varnish over the grip with three thin coats of Sutherland Welles Ltd® Marine Spar Varnish. 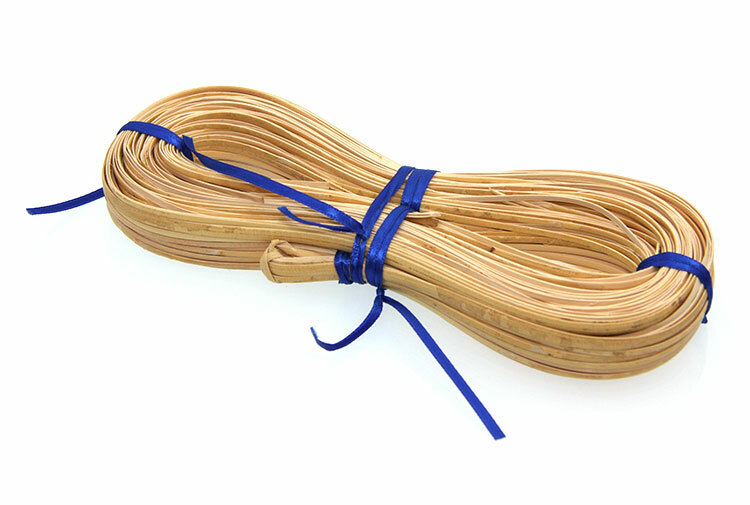 All rattan is packaged in 270’ hanks; individual strips vary in length; splices may be necessary, but not more than two per grip and even that is rare. and coated with spar varnish. The maker is our graphics man, Matt West. There’s approximately 270 feet of rattan in each hank. You know that, and you can dredge up an old geometry formula: Circumference = 2×3.14xRadius. So let’s say your grip is 1″ Outside Diameter in a straight cylinder, which it surely won’t be, but that’s close for guestimating rattan usage and it makes the math easy. You’re using about 3.14″ of rattan per 2.5 mm of grip length. 178mm (grip length)/2.5mm (width of rattan strip) = ~71 turns, plus you need some extra to work with, so let’s call it 75 turns. 270′ / 19.5′ = ~13 grips. PLEASE check my math and know that even if I did all that right, I’m estimating in all directions. It’s probably safe to say you can get about a dozen grips from one hank. If you buy it and find that I’m wrong, please don’t hesitate to write.